Includes APPS Certification Manual, video + three attempts at exam within one year of purchase. 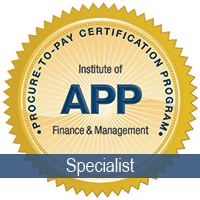 Earning your Accredited Procure-to-Pay Specialist (APPS) certification from IOFM/AP & P2P Network means a lot to you: more respect, a stronger resume, and higher earning power. It also means a lot to your employer: you’ll be seen as a more valuable asset to your department, a reliable resource for answers and expertise, and a true team leader. Estimated Learning Hours: 9 t 14.